On The Path: Our Problem is Not the President, It's Us. I saw this Facebook meme a few days ago and had to share it. I also felt compelled to make a post about it here. 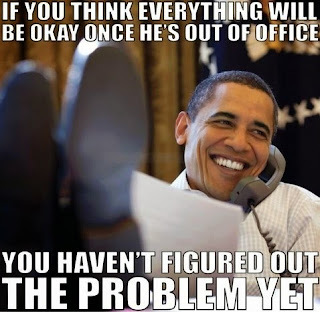 For my lifetime anyway, it seems all blame for the problems of our country fall squarely on the President. While I have not been a fan or really impressed by any President since I've been of voting age, I can blame everything on them. Lots of things yes, but not everything. I'm also very sure things for this country won't improve in two years regardless of who we elect as our next President. For starters, the type of people who could fix things are rarely the type of person who will or feasible can run for elected office. The type of people who run for office are typically, but not always; politically well connected, well off financially, are pros at saying what people want to hear, and are completely narcissistic and run for office primary for the power of the office. I say typically, I'm sure the people in office you like and continually vote for are completely different. While the President is the lightning rod for our political angst, not much that he does can be done without Congress. You know, that branch of our Federal government that maintains about a 20% approval rating. The stat that 80% of the people don't approve of Congress amazes me for several reasons. First off, this very low rating isn't a recent spike. Congress has pretty much maintains a below 50% approval rating. People who we picked to go to Washington, DC as a whole do not meet our approval. Not only do we send duds to DC, we keep sending the same ones back! Representatives’ average tenure (10.4 years)." We are sending the same people back to DC for an average period of time that is longer than the average person holds a job. The same people that only 20% of us think is doing a good job. Why do we do this? Simple, we refuse to accept the fact that we vote for career politicians who only say what we want to hear so they can hold on to their seats of power. Like I said above, I'm sure the people in office you like and continually vote for are completely different. And that's the problem. We refuse to admit we vote for people who should not voted for. We, the American People fit the often said definition of insanity: doing the same thing over and over again and expecting different results. We complain about career politicians like Boehner, Feinsten, Hatch, McCain, Pelosi, and Reid yet we are the same fools who keep sending them back. Why do we do this? Two reason I can think of. We vote along party lines regardless of the person representing the party, and the "I hate Congress but love my Congressman" syndrome we all seem to have. "He's been serving my District for 15 terms, he know Washington" is a common excuse to keep sending some one back. Yep, he know Washington, mainly how to keep himself there while having a 20% approval rating. Let's think about that. Would you go to a Doctor that had a 20% approval rating? Would you buy a house from a Relator that had a 20% approval rating? Would you eat at a restaurant that had a 20% approval rating? Would you send your kids to a daycare that had a 20% approval rating? But you're okay sending your Senators and Representative back to a Congress that has a 20% approval rating. A Congress that is pivotal in running our Country. We could easily fix this in two election cycles. But of course it would involve some work and changes on our end. We would actually have to research the candidates and not vote based on name recognition, celebrity endorsement or party line. Yes, we will actually have to put some thought into it. We will actually have to vote at primary elections too. Most importantly, we need to pick the candidate we feel is the best. Not who the union endorses, or paper endorses, or who has the most yard signs in your neighborhood, or the political party Grandpa was active in. Sadly this is something that vast majority of us can not and will not do; and our 20% Congressional approval rating proves it.